Fresh remodeling and fresh décor make Beach Grass a wonderful vacation location for the smaller group. Enjoy the convenient location with the beach and downtown an easy stroll. The cottage décor is relaxed and airy with sliders opening out to a deck and fenced in backyard. Great little place. Seemed like a cute, safe street. Great location! 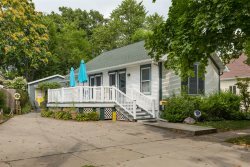 Walking distance to kids park, the beach, and Phoenix St. If you have kids, have a wagon for all the gear. South Haven was a fun lake town, and everyone was very friendly and helpful. Great weekend get a way for my family of 3! The website and rental experience was very pleasant and easy to use. We very much enjoyed our stay at Beach Grasss. It has now become another great South Haven vacation memory! We did not set up the rental so we did not really work with the team members. We did receive an email about staying a few hours later since the weekend was so crummy. the call/email was nice and pleasant. Property was smaller than expected by the photos. The neighborhood was peaceful and folks were out walking in the neighborhood. it was a little odd to be sitting in the living room and being almost on top of the side walk - watching people walk by. We recommended the unit to our kids to visit because of the walk to the lake, the KIDS corner play ground and the bunk beds. The shores staff was very pleasant and helpful. The house is recently updated and was a great fit for our family of five. The location is wonderful and the coded entry is great so each family member could enter without worrying about keys. We sat on the front porch each night and enjoyed the neighborhood view. We had a wonderful time! We will see you next summer. When it was time for us to check out on Saturday, we discovered our car battery was dead. We were able to jump it with help from a neighbor, but of course in the midst of asking for help, arranging the vehicles in driveways, and packing the car with "help" from our three kid, it began to pour down rain. All of this, literally 30 minutes before we were supposed to be out of the house. Did I mention that as the car re-started, the alarm went off for 10 minutes solid? And there was not a thing we could do to make it stop? When the housekeeper from Shores arrived, she was so kind and so patient. We were very frazzled, to say the least. But she greeted us with an understanding smile, and didn't make us feel at all like we needed to hurry because it was 3 minutes past our "deadline". It was a huge relief and provided a moment of calm in the chaos. The property was a good location for park, beach, and town; the price was good for the house. While the house was well-stocked and freshened up, after being there a few days, it was obvious that the remodeling was a quick, slap-it-up-and finish -quickly job. The trim paint is allowing the wood sap to ooze through; the trim doesn't quite fit in some places; the bathroom door looks like my kid painted it; the island countertop is not securely attached to the post legs - which is a safety issue and concern. It looks ok overall, but when you start noticing the details, it's a different story. Dawn and Sally were familiar with the property, and able to tell us we could have a large outdoor group (25) for dinners. (daughter Chris Ferris, catering) Sunday a staff member politely stopped by to help remind us the trash went out Monday morning. Cable TV did not work, within 30 minutes of my call to the office, all was resolved.